Sunday morning in Guatemala City finds us hosting not only the arriving sponsors but a special sponsored family as well. Alcida came to thank the sponsors and especially sponsor Sylvia for all they are doing for her youngest son, Kevin. Alcida has a good husband who works as a stockman in a warehouse. At the Mayan Ruins of Iximche, we were blessed with a cool and breezy morning. The children, mothers and staff from the CFCA project in Patzun had prepared folkloric numbers. They seemed to fit naturally in our open-air theater. The outfits, dance numbers and songs demonstrate great love and creativity. Sponsors were able to visit the ruins and then enjoyed a hot lunch under the high pine trees. We take our leave and make our way through the highlands and on to San Lucas Toliman in time for the 5:00 p.m. Mass. We are fortunate to have Father Greg Shaffer here in San Lucas. Sponsor Andrea with Martha (far right) and family. Martha sang for us in her native Tzutuhil language. 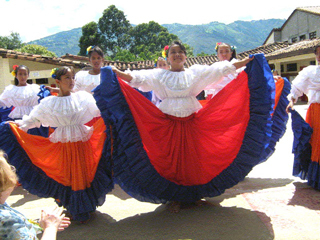 CFCA scholars in Ocotepeque, under the direction of staff member Juan Ramon Santos, have formed a very talented dance troupe. An inspiring testimony was offered on the Monday morning of the mission awareness trip. Dona Albertina and her three children, Lester, Manuel and Tanya, spoke of the challenges of living with a husband and father afflicted with a drinking problem. 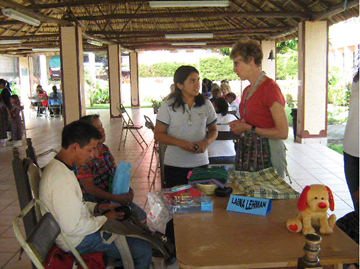 Albertina learned to be a seamstress through courses offered at CFCA. She now has a growing sewing business operating out of their home. She and the children attribute their more dignified living to the encouragement and help they receive from their sponsors and the CFCA community. Lester graduates this year with a degree in business. Tanya and Manuel are doing very well in 7th and 9th grade. Sponsors had meaningful experiences with the families they visited, and they listened to powerful personal testimonies. Just in Ocotepeque, 12 new children and one aging person were sponsored on this trip. In addition, this enthusiastic group has requested 74 folders of children and aging people who are waiting to be sponsored. May God bless their efforts. We were privileged to hear the testimony of the Osorio family. Both mom and dad work hard and produce a modest income for the family of seven. After thethe birth of their first girl, Gabriela, now 16, they were blessed with four more children, Jose, Cristian, Oscar and Eduardo. Luis, the father, is a gentle man made of iron. He makes a modest income hauling firewood from the forest using only a leather forehead strap (mecapal) and ropes. Martha markets door-to-door the fine aluminum bread pans she makes at home. This is our fourth Mission Awareness Trip to this country. Medellin is hosting for the next few days a meeting of the OASóOrganization of American States. Security forces abound. Coordinator Transito Hernandez gave us a very fine overview of Project Antioquia. 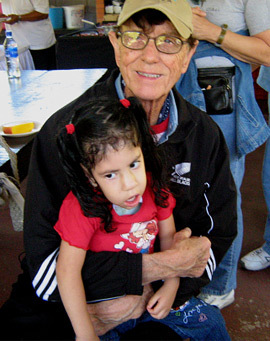 The sponsored children offer the world smiles, beauty and grace in the harshness of the high neighbors of Medellin. 1. Alphabetization, elementary and junior high equivalencyófacilitated mainly by scholars and volunteers. 2. Good training by professional and dedicated teachers in livelihood projects, with over 90 percent of sponsored mothers participating. These mothers currently produce school uniforms for 32 schools. 3. Beauty shops, bakeries for all kinds of breads and cakes–also for schools and special events. We visited subproject PN in La Pintada, surrounded by mountains 48 miles south of Medellin in the valley of the Cauca River. The Cauca is at flood stage as I write and 41 of our 237 sponsored families have been forced to leave their homes. Sisters serving here speak of the reality of this town of 10,000 including child labor, child abuse, pregnancies in the early teens, lack of employment opportunity, very little environmental planning and intra-family violence. The CFCA presence in La Pintada has grown little by little, with the sponsorship of boys and girls who before hung out on the street without much incentive to go to school. 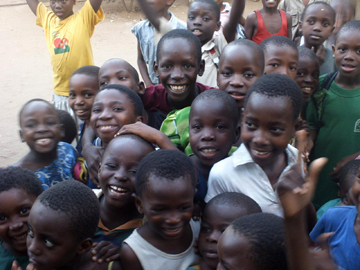 We now have 237 children in the program attending school and six scholars in higher education. The elderly also have a good program. Because of the CFCA sponsorship program in La Pintada, 140 elderly and 225 children enjoy a nutritious lunch every school day. 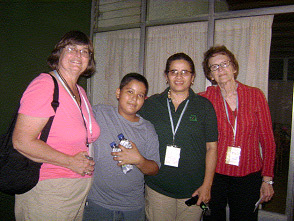 This May 2008, we are 21 CFCA pilgrims in Venezuela, 18 sponsors plus Sheila Myers (Communications Department, CFCA-Kansas), Cristina and myself, Bob Hentzen. Three of our trip participants are Catholic priests. They have expressed great enthusiasm about the work and the future of CFCA. The Venezuelan staff and sponsored families tell us how much they have been looking forward to having the sponsors here. 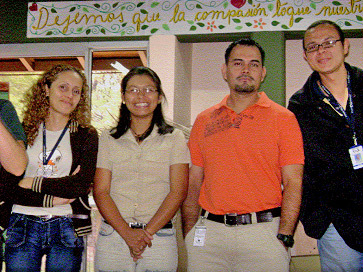 The CFCA program in Venezuela can boast of a very loving and professional staff. They model the community they proclaim. Sponsored families are responding to this example. The CFCA communities serve as a leaven, a beacon of hope and a sign of Godís love. My brother Bud and I made our way by land from Colombia to Venezuela in 1983 to visit with Father Jerry Beat and Father Angel Riba. 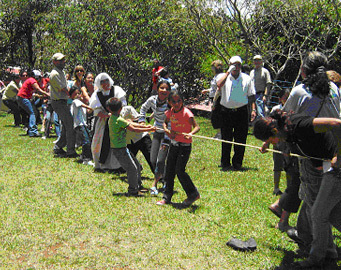 Since that time, the CFCA program in Venezuela has grown to 5536 children, 665 elderly and 22 vocation sponsorships. Almost 800 children and aging from Venezuela are on our waiting list for sponsorship. “godspeed” from sponsors Kay (l) and Esther (r). Project Coordinator Sunilde Perez, who has been with CFCA for 11 years, and sponsored child David, 13, will represent Venezuela and CFCA at an interfaith conference in Japan sponsored by the Arigatou Foundation. The conference will address poverty and ecological questions relating to children and intra-family violence. The Barquisimeto project has implemented nine commissions with representatives from all subprojects to oversee the delivery of benefits and services to sponsored members. These groups are born from the expressed felt needs of our sponsored families. They cover the following themes: Education, Nutrition, Health, Correspondence, Finance, Fundraising, Recreation, Sports and Culture. The commissions are a grassroots organization which includes the mothers. I am so very pleased and impressed that mothers of sponsored children are confidently giving these presentations to sponsors on the trip. 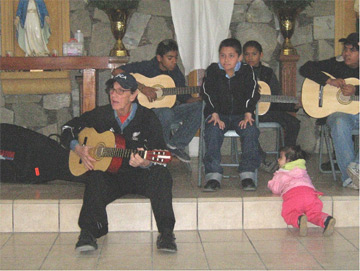 Scholar Adrian Mendoza works with the children and youth in Ciudad de los Muchachos, a foster home for girls and boys. “We want to give our youth tools to continue,” he said. 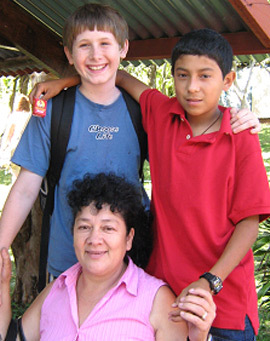 Adrian grew up in Ciudad de los Muchachos (subproject M) and was sponsored through CFCA from age 7 to 17. He then became a CFCA scholar and has now graduated from college with a major in business administration. Adrian will continue his studies in psychology. He still lives and works at Ciudad de los Muchachos. He communicates very well and shows tremendous poise and rapport with the children and staff. On Wednesday, we enjoyed an outing in Humucaro Alto (subproject HRA), about two hours from Barquisimeto, with children who are sponsored by members of this group. The entire project was on hand to welcome and to celebrate the visit of the sponsors. As we passed through small towns, parents, staff members and children were out on the highway awaiting our caravan and waving us on. They really do have a strong sense of belonging. How encouraging is this clear identification with CFCA. This day was a real CFCA fiesta. The age span was from 99 years to newborn. Mothers, dads, youth, children and staff were involved in the many activities: Holy Mass with special commemoration of the fiftieth wedding anniversary of Lois and Walt Silvernale, cooking and organizing a nice hot lunch for hundreds, a theatrical production on the history of CFCA, folk dances and songs and visits to families. May our loving God continue to bless us all in the great adventure of CFCA. 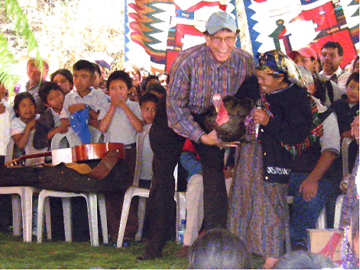 Just within the last month, we celebrated the April 2008 Mission Awareness Trip to Guatemala, the Latin American Staff Encounter, the Organizational Audit of Project Hermano Pedro and a week’s trip to Chile. 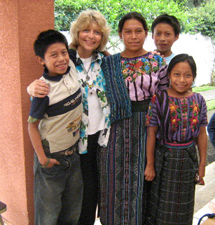 I am filled with gratitude and pleased to bring you this news of our May 2008 MAT trip to Guatemala. In spite of the recent loss of his daughter, Renee, sponsor Jerry Menard is here with us. We are inspired by his spirit. On May 15, the Feast of San Isidro Labrador, Father Greg Schaffer offered Holy Mass for Renee, Jerry and their family, with all the sponsors and the elementary school children in attendance. When sponsor Laina visited Guatemala in May 2005, her sponsored boy Cesar had dropped out of school—this in spite of a good academic record. As the oldest boy, he had gone off to the capital city in search of work in order to help his family. We struggled to locate Cesar during the MAT and the effort really paid off. Laina and I talked with Cesar and his mother. Laina offered to help his family during these years of schooling. Happily Cesar returned home and went back to school. Cesar will graduate as a young professional accountant later this year. Laina wants to make an Individual Sponsor Visit to attend his graduation. During our first Sunday morning in Guatemala City, we were deeply touched by the testimonies of a single mother, Mari, her sponsored son Kevin, 11, and little daughter Kimberly, 6. A few years ago, the family moved to Guatemala City from the countryside. In her poverty, she was able to attend only two grades of elementary school. Mari married young. She found herself facing life alone when the father of the children left and remarried. 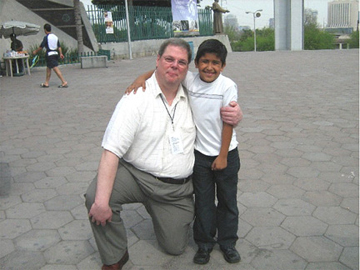 In the last six months, Kevin had two surgeries to correct herniasóthis with the loving help of his sponsor. He is a confident boy. He offered an emotional dramatization of a poem about his grandmother. Lively Kimberly spoke, too, thanking the sponsors for helping her brother and sadly lamenting the split up of her parents. When I mentioned to the sponsors that Kimberly was not yet sponsored, it took Jerry Menard about three seconds to step forward and sponsor her. Tomorrow, we will bring Kimberly out to San Lucas to spend the day with Jerry. Thanks for your solidarity and prayers. Cristina and I now head to Venezuela for another mission awareness trip, then to the Nicaragua Staff Encuentro meeting, followed by a Colombia MAT and then up to Kansas City for our exciting annual gathering. We look forward to seeing each of you. God’s blessings. In March, Rachel Scherzer, who works in Child Services at the CFCA Kansas City office, traveled to Tanzania to visit her sponsored child, Bariki. She spent more than a week living and volunteering at the CFCA Dar es Salaam project. This week we will post a series of reflections from her trip that she e-mailed home. Rachel hopes to return to Tanzania soon! Today was my first day at the project and I got to see it in full force. I don’t know if I will ever really be able to describe it but it was incredible. They have an intensive day program for about 12 kids who are HIV positive (including my sponsored child, Bariki). They spend the whole day at the project and get all their medicine and meals here. 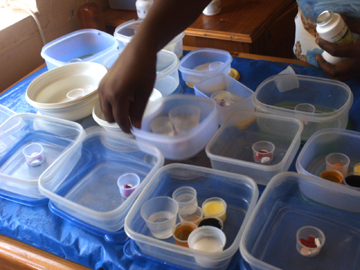 I watched the staff put out all their medications for them, and it was staggering what these kids have to take every single day, twice a day. A new little girl was admitted to Intensive Day Therapy today, so we had our first day together. Her name is Neema. Her AIDS is full blown, which basically means she has no immune system. She had sores from shingles all down her right arm. But the odd (and very cool) thing is that all the kids are really energetic and happy. I am also getting stared at like you would not believe. I am one of two white people in the entire city. There are about 2,000 kids at the school here, and I think I was gawked at by every single one. In the nursery school the kids followed me around. Just stopped what they were doing to come over and look at/touch/hug the white girl. It’s a real joy to share this mission awareness trip with you. We are a nice big group, with many children, youth and aging to be visited and plenty to learn. This is the season of Pascua (Easter); of life-giving rains; of planting and gratitude and hope. More than 400 mothers and children met us up on the Panamerican Highway and walked with us to Zaragoza with an abundance of hymns and firecrackers. Great memories. A good number of these folks walked with us in 1996 and they remember it. Today these campesino (farm worker) families shared the fruits of their labor in the fields. Our pickup is now heavily laden with fresh tomatoes, peaches, apples and beautiful flowers. On our way to Guatemala City to meet the sponsors, we spent an entire day visiting sponsored families in the area of Zaragoza. 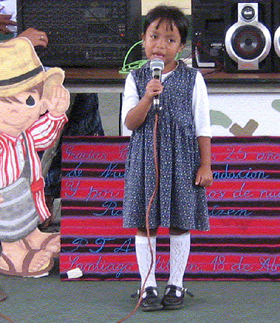 We have 1,687 sponsored children in Zaragoza and 60 CFCA scholars. Today we were able to turn over the ownership and keys to five new homes. The team here did a good job in selecting these families; healthy attitudes; real need; a view to the future; a commitment to keep their children in school. Myra is only 29, but she has seen a lot of life: education to the 4th grade, an abusive relationship, abandonment, two daughters ages 10 and 8. In the last two years, just in Project Hermano Pedro we have been able to turn over new homes to more than 480 sponsored families. I can’t think of a better way to prepare for a mission awareness trip than visiting these families. 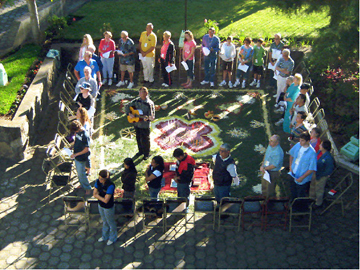 Facing west during the Mayan prayer service, sponsors and staff reflect on the sunset as a symbol of life after death. With two children of her own, Luisa Morales, community worker in Guatemala City, is in her sixth year with CFCA. To share this morning with the sponsors, Luisa brought Ana Beatriz, 14. Ana Beatriz has been sponsored by Janet for the past nine years. When she turned 10, Ana Beatriz was diagnosed with severe liver failure. She needed a transplant. Her older sibling, Roland, came forward and offered to become a donor. A foundation in Spain invited them to Madrid for the surgery. Ana’s mother, Imelda, with a total of seven children, finds herself as the sole support after their father took off. One of her daughters is married. Imelda informed us that both Ana Beatriz and Roland are doing very well now. On our visit to Aldea Pujujil, where 218 children are sponsored, our sponsors braved some steep paths on foot to visit a humble widow and two sponsored children who wanted to express their gratitude for sponsorship and for their new CFCA home. 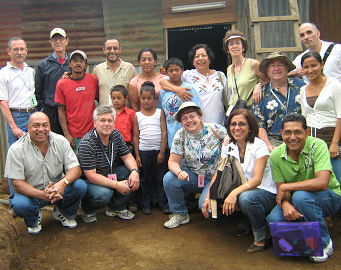 This family visit was followed by a gathering in the lean-to shelter for this CFCA community. I find them beautifully shy, but admirable in their hope. I calculate about 300 children and parents. En route to Antigua through the highlands, we visit Chimaltenango with 8,721 sponsored children and teens in this region along with 461 aging and 287 scholars. Nine new children were sponsored during this trip, and the sponsors got to meet their new children and parents. Thank you for being with us during this mission awareness trip, so rich in experiences and blessings. Godís blessings. First on the agenda was Holy Mass at El Poro section of San Ramon in the Chapel of San Antonio de Padua. Father Chepe, a native of Panama, has shoulder-length hair and could easily pass as a San Blas or Guatuso Indian. He took the readings from the Acts and St. Peter and handily brought us all into the Costa Rican reality of March 30, 2008. CFCA community promoters in the San Ramon subproject report that 350-400 children, youth and aging, and expectant mothers are able to have a good lunch each school day. For me, a very sacred encounter took place between sponsor Julie Pringle, one of her seven children, Quincy, their sponsored boy, Yarito, and Yarito’s mother, Elba. 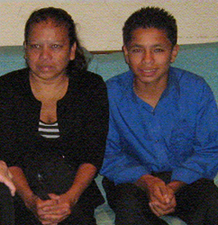 Elba was born dirt poor in Matagalpa, Nicaragua, and struggled with an abusive husband. One morning, she sent her four children in the back of a neighbor’s pickup to haul drinking water. The irresponsible driver rolled the truck on a dirt road at high speed. Elba’s 13-year-old daughter, Miriam, died on impact. The other four were hurt, including Yarito. The family somehow made it past the ever-present border guards, and headed for the Central Valley of Costa Rica and San Ramon. Today, Divine Mercy Sunday, the mothers Julie and Elba hit if off. Quincy and Yarito hit it off. One could read it in their eyes. Somehow in God’s mercy, the circle was complete; and the Mass was just beginning. CFCA is involved in very challenging section of Heredia called Guarari. This is considered a high-risk community because of the high levels of robbery, drug dealing, assaults, sexual abuse, domestic violence, family disintegration, school dropouts and unemployment. In our visits to sponsored families, I note that the area is intolerably polluted by the black waters of a huge shopping mall located three or four blocks upstream. It would be an understatement to say that the families are struggling. Most of them are immigrants from Nicaragua, forced to try to survive under extremely difficult conditions. After a bone-chilling bus ride north, we dedicated a nice new classroom in El Pavon. This fine structure was made possible through the dedication of 9-year-old sponsor Emily and her parents, Dawn and Ed. 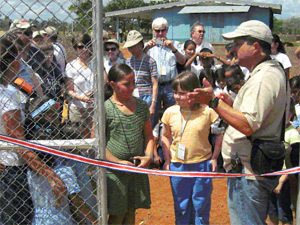 Emily cut the ribbon to the new building with one of their sponsored children, Daniela. How beautiful to see the bonding between these two young girls. Trip participants were impacted by the difference between this nice new facility and the former make-do classroom. According to CFCA staff, the Los Chiles area near the Nicaraguan border has been seriously neglected. Our visits to homes here speak of extreme poverty. Work harvesting oranges, pineapple or sugarcane lasts scarcely four months. We spent the day at a nice park with the sponsored children, parents, staff and U.S. student volunteer translators, mixing games, music, dancing, good food and a beautiful blue sky. What a joy to see our own sponsored little girl, 4-year-old Cristina (Cri Cri), and to see her walking. Three years ago, doctors said she would probably not survive six months. Cristina and I sponsored her anyway. With God’s grace and the loving care of the Sisters, this little fighter is defying all the odds. Hundreds of people received us in the street of this challenging neighborhood. Vicenta, at age 32, has seen a lot of life—two boys, one little girl and a husband long gone. They’re literally dirt poor in a drainage area where things stay humid. Very early each morning, Vicenta climbs the embankment with her baskets and treks to market to buy vegetables for resale in the neighborhood. During coffee harvest, she and the children travel to one of the farms after school to pick coffee. Following the family visits, we gathered at the CFCA center in Alajuelita to see handicrafts and foods produced by the mothers and elderly, and in the presence of the sponsored elderly Queen and King of the fiesta, we accompanied the elderly, the children and youth in dancing. My one step fits all. Thank you for being with us on this journey. We live in gratitude for your solidarity and prayers. Best wishes from our March 2008 mission awareness trip group. It’s nice to be home. Our sponsors have made the effort to place themselves in the midst of this ancient culture in which all of God’s creation is seen as sacred. We thank our loving God for the privilege of just being here. From the very first morning in Guatemala City, this has been a very blessed time. I am inspired by the courage and zeal of Natividad. 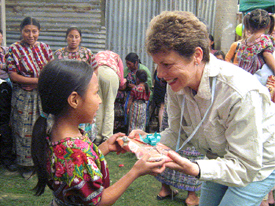 She is now a CFCA social worker in some of the toughest areas of Guatemala City. Natividad grew up as a sponsored child. This first morning of the trip, Natividad brought a sponsored family from the edges of the grand metropolis to meet the sponsors, to have a good breakfast with us and to share their struggle and their dreams. The father, Braulio, rents a small piece of land in San Jose Nacahuil on which he plants corn and beans. I find that he lights up when he talks about farming. He deeply respects the land and explains how he kneels and prays before disturbing the pachamama (Mother Earth) with his 18-inch hoe. Once the land is prepared and the seeds are in the ground, he prays for life-giving rains. Many days, Braulio wakes up unemployed. On these occasions, he leaves home at first light with ax, machete and rawhide mecapal (headband), and treks each time further in search of firewood. Even for essentials like fallen wood, land owners are sometimes trigger happy when a campesino ventures across their fence line. When he can, Braulio hires out as a day laborer. The going rate for day workers in his area is about $6 per day. He plays guitar for liturgies at the parish. Mother Sylvana works very hard at home caring for her own father, who is bedridden with a stroke. Their oldest son, Pantaleon, works on construction sites during the week and studies on weekends. Marta Alicia, 13, is in her first year of junior high. Their second son, Rolando, 15, was born with a good mind, but with quite a list of physical challenges. Rolando is sponsored. He thanks his sponsors for their love and medical help, and he demonstrates his gratitude by studying hard to become an accountant. Friday in Patzun was special. Seven newly sponsored children were personally met, welcomed into the CFCA family and sent on their way with hearts full of dreams. Our dynamic and devoted community workers from Project Patzun offer a traditional musical greeting to the sponsors. Each of them visits 325 sponsored families in the villages of the highlands. Cristina and I wish you a restful and hopeful Holy Week and Easter.